A Snowy SOAR in Lake Tahoe. One of my favourite things about traveling is revisiting places made familiar years earlier. 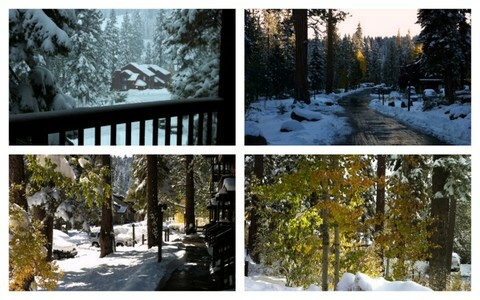 I just returned from SOAR (Spin-Off Autumn Retreat) 2012, held at the Granlibakken Resort at Lake Tahoe, California. SOAR changes location each year and was last held at the Granlibakken in 2006, when I attended as a scholarship recipient. SOAR is a fast-paced, fiber-filled week of workshops. Experiencing SOAR for the first time that year, I was immediately swept into the current of the event. New people, fascinating conversations, fiber everywhere—and my first brushes with those individuals that would become, and forever be, my mentors. Snow. When I arrived it was seventy degrees. By the next day, this is what was outside my window. It snowed for days and then the sun came out—spectacular! Snow at the Granlibakken Resort, Tahoe City, California. 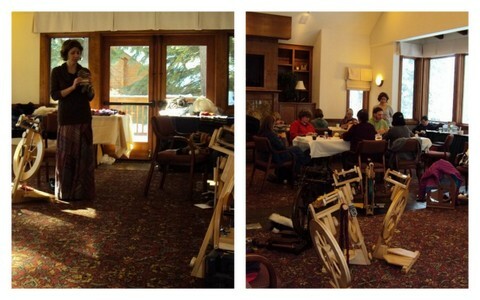 Amy Clarke Moore, the lovely editor of Spin-Off and Jane Austen Knits, took some pictures of my three-day workshop. My classroom was amazing: huge windows on three sides looking out into the snowy trees. We spent the afternoons knitting round the fireplace—really. I had so many wonderful people in my classes all week. I hope they had as much fun as I did! 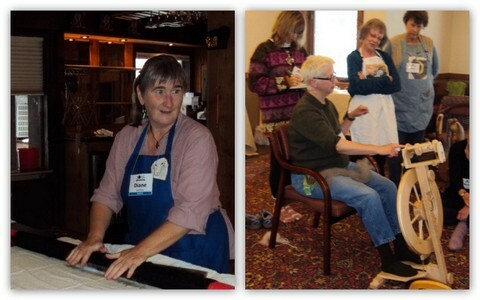 Amy Clarke Moore took some great pictures of workshops in progress. View more on Facebook. Unexpected bonus: my colorwork bag was on the cover of the SOAR event booklet. Yay! One of the high points of the experience was getting to know some of the other mentors a bit better. They are such an amazing group of interesting folks. Now back at home, I know that I will continue to carry the creative inertia of the SOAR community through my year. Two of my fellow first time SOAR mentors: Diane Gonthier and Amy Tyler (left to right). Photos by Amy Clarke Moore. Kate, that’s so neat. I’m so happy for you, that you are doing something you love and are getting recognized for it. You deserve it! Thanks, Amanda! I had a blast! Happy to hear you are safely back home. Bet the sheep were happy to see you! I, for one, am thrilled you mentored at SOAR. Your class was fantastic! I learned so much’ I love my little mitten! Every class I had was stellar, but I’ll be watching for more of your classes in the future! It was great to meet you, Chris. I’m glad you like your little mitten—excellent job!